We are not lacking hypothesis about the recent hiatus - or stagnation- in the global mean temperature: the ocean is taking up more heat, stratospheric water vapour has decreased, the sun has recently weakened and volcanic activity has also gathered a quicker clip. A preliminary look at the structure of the stagnation may, or may not, offer some clues about how likely which of these hypothesis, or which combination, may end up being the correct one. The global mean temperatures observed in the last 15 years are indeed at the very lower edge of the ensemble of trends simulated by climate models. This is the main message of our manuscript and the paper by Fyfe et al.. It has been argued that the starting year in the 15-year period used to compute the trends is misleading because 1998 experienced y very strong El Niño, but by now almost everyone recognizes that, whereas in reality the causes of the hiatus may still very well compatible with the effect of greenhouse gas forcing, current climate models have serious difficulties in simulating such low temperature trends as observed in this period when they are forced by the present external forcings and reasonable extrapolations of this forcing into the future. One important caveat here is that climate projections into the future assume constant solar activity and no volcanic activity, which arguably is not totally realistic. One intriguing aspect of the stagnation is that it has not been equally distribution across all 12 months of the annual cycle. It has mainly occurred during the months of December, January and February, with the trends in June, July and August over the last 15 years being more similar to the corresponding trends in the period 1980 to 1997. Form the CMIP5 ensemble of climate models that is being used in the 5th IPCC Assessment Report we can derive an ensemble of 15-year periods chosen from the simulations driven by the RCP4.5 scenario from 2005 until 2060 (from a total of 109 simulations, 6104 overlapping 15-year segments) Only 2 per thousand of these 6104 15-year trends are lower than the trends observed during December-to-February in 1998-2012 (HadCRUT4). This occurs in 5% of the trends of the boreal summer season (June-to-August), and in 2 % of the annual means. What is the spatial 'fingerprint' of the stagnation, or in other words, in which regions are the recent temperature trends more strongly subdued - or even become negative- and in which regions the trends continue unabated ? The following figure tries to give a visual impression of this spatial structure for the December-to-February case. For each grid cell in the HadCRUT4 data set we have computed the linear trend in two periods: 1998-2012 and 1980-1997, and then taken the difference. Negative values indicate the grid-cells where temperature trends have recently slowed ; positive values, where they have recently increased relative to the 'base period' 1980-1997. This has been also found by Cohen et al. applying slightly different methods. It is obvious that, although trends have recently become smaller in general, the region and the season bearing the brunt of the temperature stagnation is Eurasia in wintertime. We will later call this pattern the DJF stagnation fingerprint. At first sight this does not seem to dovetail with an increased heat uptake by the ocean nor with a driving role of the Tropical Pacific, as suggested by the recently published paper by Kosaka et al. . It looks to us rather like the effect of the North Atlantic Oscillation on surface temperatures with some additional global contribution. The NAO has shown up in its negative phase in the recent Northern Hemisphere winters, favouring a more meridional circulation and causing polar air intrusions in Eurasia. It is, however, not totally clear how an atmospheric circulation mode, which in principle just shuffles air masses around, can influence global mean temperatures. Wallace et al suggested long ago that the NAO would modify the heat fluxes to the ocean by advecting cold/warm air masses from the continents to the ocean surface. The NAO might also modulate cloud cover that, in turn, could modify the global radiation balance, but this is not widely accepted and, to our knowledge, these lines of research has not be followed up. Even if the temperature stagnation is indeed related to the NAO, the main question mark in this puzzle still remains : is the stagnation due to internal stochastic variations or to the external forcings ? The NAO is known to be an internal model of climate variability, but it is clearly influenced by the external forcing as well. Future climate projections participating in the CMIP3 project showed that the NAO would tend to shift to a more positive model under greenhouse has warming. Shindell et al. found in climate simulations conducted with the GISS model a few years ago that the NAO could also be affected by solar forcing - and this is the interesting link I would like to put forward here - provided that the climate model includes a well-resolved stratosphere with the corresponding ozone-related chemistry. They found that low solar irradiance would nudge the NAO toward a negative state, and this could explain the extreme European cold temperatures during the Late Maunder Minimum. Is this happening now again, albeit in a lesser magnitude ? If it is, then a weaker sun would explain a global tendency to weaker temperature trends, with a stronger slow down over Eurasia. 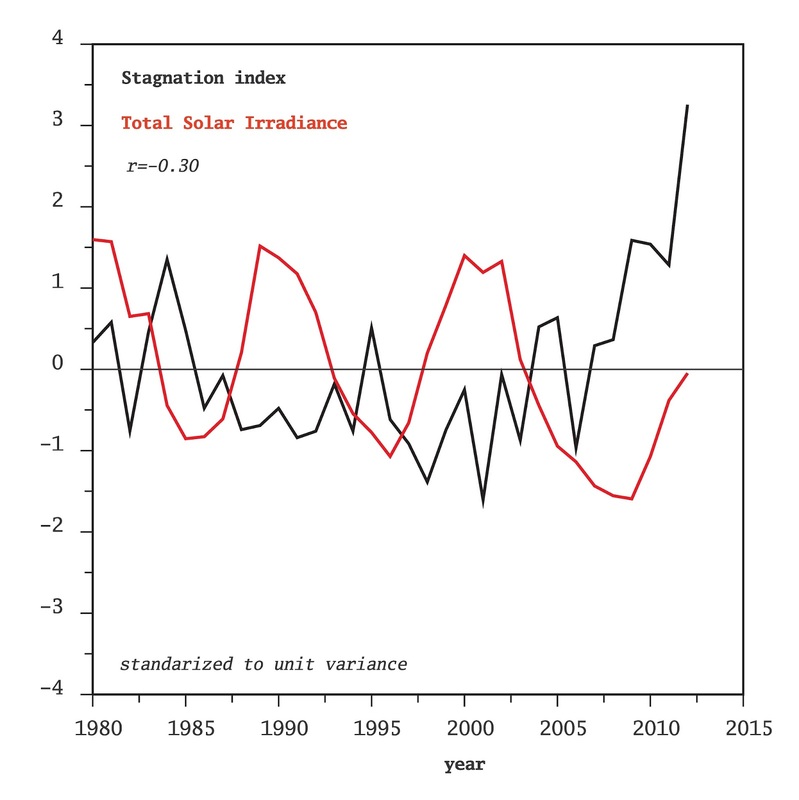 The following figure shows two time series: one describes the strength with which DJF stagnation fingerprint appears in each boreal winter, denoted here stagnation index (in the winters in which the index is strongly positive the spatial fingerprint of the stagnation is particularly strongly represented in the data of that boreal winter); the second time series displays the Total Solar Irradiance. The correlation between both is just suggestive of a weak link, but it is clearly not a definitive proof. Clearly, this fingerprint is expressing itself very strongly in the last few years, but without a corresponding drop in solar activity. Something else is happening that is not captured by this quite preliminary explanation. Finally, another question mark. Over the past millennium, solar activity and volcanic activity appear statistically anti-correlated. In fact, this is one of the difficulties to disentangle the effect of each of these forcings on surface temperatures in the last centuries. And, intriguingly enough, we see the same phenomenon again in the last 15 years: a weaker sun and more volcanic aerosols. Does anyone dare an explanation ? As for "...a weaker sun and more volcanic aerosols. Does anyone dare an explanation ? ", there is an article in Gondwana Research 19 (2011) pp 1054-1061, "Explosive volcanic eruptions triggered by cosmic rays: Volcano as a bubble chamber", by Toshikazu Ebisuzaki et al. Volcanoes with silica-rich and highly viscous magma tend to produce violent explosive eruptions that result in disasters in local communities and that strongly affect the global environment. We examined the timing of 11 eruptive events that produced silica-rich magma from four volcanoes in Japan (Mt. Fuji, Mt. Usu, Myojin-sho, and Satsuma-Iwo-jima) over the past 306 years (from AD 1700 to AD 2005). Nine of the 11 events occurred during inactive phases of solar magnetic activity (solar minimum), which is well indexed by the group sunspot number. This strong association between eruption timing and the solar minimum is statistically significant to a confidence level of 96.7%. This relationship is not observed for eruptions from volcanoes with relatively silica-poor magma, such as Izu-Ohshima. It is well known that the cosmic-ray flux is negatively correlated with solar magnetic activity, as the strong magnetic field in the solar wind repels charged particles such as galactic cosmic rays that originate from outside of the solar system. The strong negative correlation observed between the timing of silica-rich eruptions and solar activity can be explained by variations in cosmic-ray flux arising from solar modulation. Because silica-rich magma has relatively high surface tension (~ 0.1 Nm−1), the homogeneous nucleation rate is so low that such magma exists in a highly supersaturated state without considerable exsolution, even when located relatively close to the surface, within the penetration range of cosmic-ray muons (1–10 GeV). These muons can contribute to nucleation in supersaturated magma, as documented by many authors studying a bubble chamber, via ionization loss. This radiation-induced nucleation can lead to the pre-eruptive exsolution of H2O in the silica-rich magma. We note the possibility that the 1991 Mt. Pinatubo eruption was triggered by the same mechanism: an increase in cosmic-ray flux triggered by Typhoon Yunya, as a decrease in atmospheric pressure results in an increase in cosmic-ray flux. We also speculate that the snowball Earth event was triggered by successive large-scale volcanic eruptions triggered by increased cosmic-ray flux due to nearby supernova explosions." I hope that this stimulates discussion, as I have thought for some time (without any proof whatever, I have to admit) that there was "very likely" (to use that famous wording from you-know-where) a connection between solar activity and volcanic eruptions. Dept. of Ancient History, Macquarie University. Thanks, Eduardo - you bring out very clearly the only conclusion we can draw now - that we need an explanation for something, which is somewhat inconsistent with our expectation. Now, we are confronted with several hypotheses, which is good, and we need to continue constructing different hypotheses. Eventually, we need to evaluate the different suggestions, but that will need time. No doubt that the scientific community will achieve this. Of course, simple minded alarmists and skeptics jump now on one possible explanation and declare it as "that is it" because it fits the pre-chosen truth of "nothing to be seen here" or "GHG theory false". Thus, we have a simple litmus test here - those with a definite answer are activists; those who see the variety of possible solutions, stick to a scientific attitude. The most significant peaks are at 21.17, and 42.33 years. Maybe this can help to find the cause of the behavior? "Of course, simple minded alarmists and skeptics jump now on one possible explanation and declare it as "that is it" because it fits the pre-chosen truth of "nothing to be seen here" or "GHG theory false". Thus, we have a simple litmus test here - those with a definite answer are activists; those who see the variety of possible solutions, stick to a scientific attitude." I hope that the entire result of this "litmus test" will be published online and distributed worldwide. Yeph, this was meant as a test for all of us (you and me, the guys from Lepizig and PIK), if we are able to see that we have to develop a whole series of possible explanations (Eduardo is beginning to do so); and finally to deconstruct them - so that the most plausible one(s) will survive(s). That takes a while. It is a litmus test of you and me. thanks for starting to systematically disentangle this for us. The focus on the area of the maximum wintertime trend-difference is certainly an interesting point of venture. It is also worth pondering why this area and season pretty much exactly correspond to the region and season where Kosaka et al. 's POGA-H hindcast doesn't perform at all. Even though I think the attention annual global average temperature gets is not justified, scientifically, this variable started the topic. So would it be possible to quantify how much of the difference of the glob. ann. avg. trend between 98-12 and 80-97 is due to this region's (~100-140E, 40-70N) winter temperatures? 40 - 140E of course. "It is a litmus test of you and me." You are right. But also for the rest of us. I am an observer. If I am skeptic I am also skeptic about skeptiks. I'm sure that you will pass the test and I hope me too. Thanks for checking! Now this is puzzling! Wouldn't that mean that Kosaka et. al get their match of global av. temp and of regional patters for the wrong reasons and that their result is an unfortunate and misleading coincidence? I guess it would be exciting to show this conclusively, but I can't think of an experiment to so so, right now. Socioeconomic development in many parts of Eurasia has stagnated at compared to the rest of the world. Thus dampening the UHI. 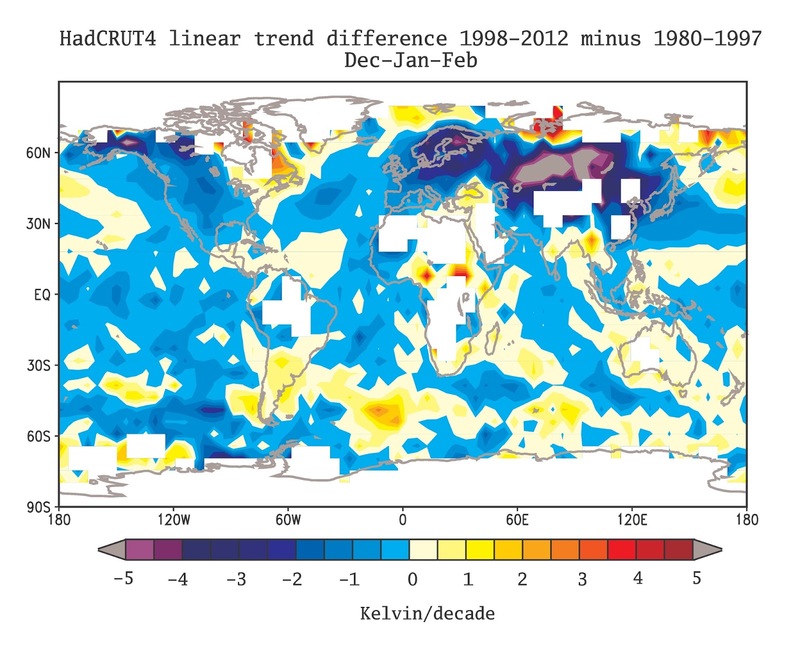 So what do satellite measurements say on these regional patterns in comparison? Nr.12: Using UAH for Eurasia gives a Trend -0,14K/ Decade for DJF and a Trend of +0,29K/decade for the rest of the year for the data 1996-now. So UHI is no explanation? I quantified this by partitioning the trend difference. Based on HadCRUT and Eurasia being a generous (0-140E, 30-70N). 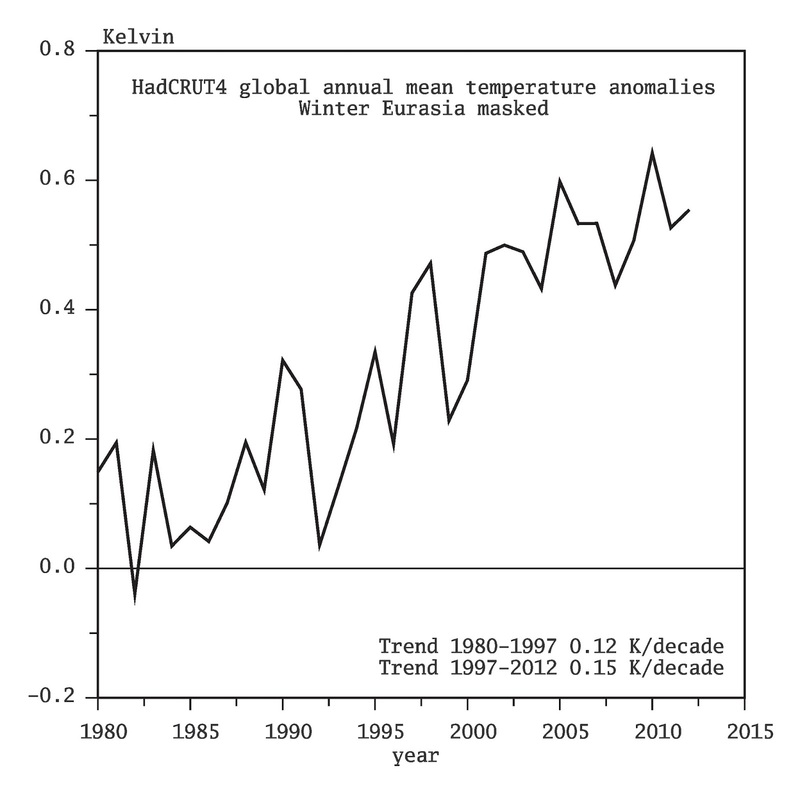 This way, Eurasian winter contributes 34% to the global annual temperature trend difference between 1980-1997 and 1998-2012. Where does that leave us? Considering that Kosaka et al. 's result for "the rest of the world" likely only captures part of the remaining 64%, I guess at least we can say that ENSO related phenomena are not the whole story when it comes to explain the "hiatus", but may play a "significant" role nevertheless. Sorry, too inconclusive for Nature :). 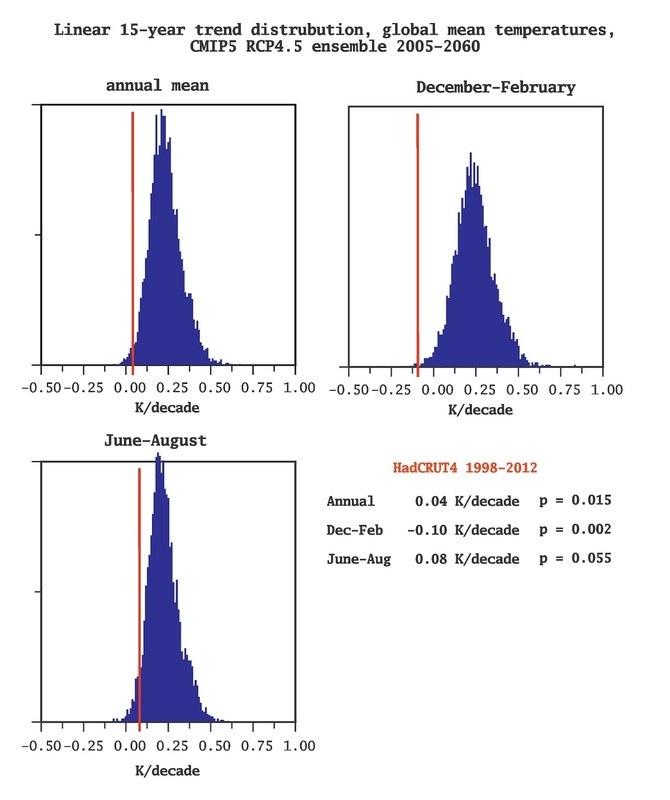 This cannot be used to asses the Kosaka-xie hypothesis because enso teleconnections affect the north pacific slp, also removing eurasia is not a good choice because a trend toward a more negative Arctic Oscillation will cool eurasia but the same pattern cause other regions of the world to warm(greenland-quebec-north-arfica and middle-east) and thus the effect on global temperature will be smaller. thank you very much for the link to that really interesting paper. Unfortunately, my knowledge of vulcanology is limited bit I can get the main lines of the argument . In essence, this explanation suggests that cosmic rays act as a seed for condensation nuclei in super-cooled silica-rich of magma - reminiscent of Svensmark theory about the influence of cosmic rays on water vapour. I wonder if this hypothesis could be tested at CERN as well. although to recreate in a laboratory conditions similar to volcanic magma can be more challenging. Anyway, it is at least one explanation , where I previously had absolutely no clue. my interpretation is also that the explanation offered by Kosaka and Xie is not the whole story. I would tend to think at this point that it is not correct.. Anonymous at #16 seems to suggest that the Tropical Pacific maybe the origin of the AO (Arctic Oscillation) or COWL pattern, but although the influence of the Tropical Pacific on North America is well established, the observations indicate that the strongest anomalies are all over Eurasia . I agree, however, that a better calculation would be to subtract the influence of the AO pattern on temperature. Since we know the values of the AO index, this can be done statistically - and it is done in may other type of studies. We would not know, however, if the AO has been externally forced or not, for instance by the weaker solar irradiance. At this point I would tend to think it has been. NASA-GISS could do an ensemble of simulations with their high-resolution-stratosphere climate model. Let us call Gavin..
the record length is about 130 years. So a periodicity of 40 years can only unfold 3 cycles, this is too low a number. Also, there are other forcing acting through the whole period, so it would be difficult to pinpoint one in particular. However, around 20 years is one of the solar cycles. Maybe it is worth pursuing further. One question would be if the 20 year solar cycle and of the possible periodicity in the Eurasian temperature are in phase. Eduardo, of course you are right. Anyway... I looked at fall snowcover ( November in Eurasia) and found also an increasing trend during last years. About the convergence fall-snowcover vs. DJF NH Temps one can find many paper, i.e. http://iopscience.iop.org/1748-9326/7/1/014007/article . Also a connection between Snowcover and NAO is possible and so to the solar SSI ( UV). The DJF-downward trend is located almost to 100% over land... so snowcover is a hot trace? than you very much indeed for this link, which I had missed completely. It seems that Cohen and colleagues have already given much though to the stagnation. Another interesting paper seems to be this one, Jeong et al cited by Cohen et al. I wonder why these papers did not find the same resonance as Kosaka and Xie. All together they do present a , at first sight, coherent hypothesis, which on top fits the observations much better. To attribute the "pause" with more "open mind" ( not only in the way of taminos ;-) ) one can make also more regional investigations. 1. When you look at the landtemps 30...60N ( Crutemp) in DJF you'll find a dramatic cooling since 2005. Maybe there is a connection to the snowcover. 2. Look at the 0-700m OHC in NH extratropics: http://climexp.knmi.nl/data/inodc_heat700_0-360E_19-90N_n.png . There is also a declining since about 2005. 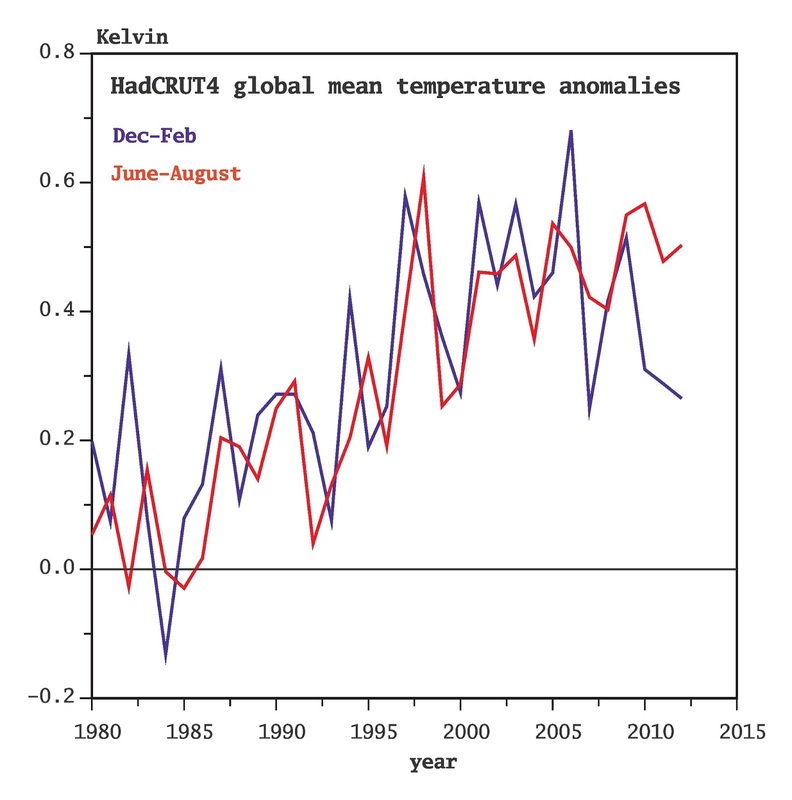 In contrast to the SH extratropics: http://climexp.knmi.nl/data/inodc_heat700_0-360E_-90--19N_n.png . where we see increasing OHC. It is a false dichotomy that Hans Von Storch presents. If nothing unusual is happening then why do we need to find an excuse for why there is nothing happening. Answer: We don't. Occams razor suggests that too many scientists were too much in love with their simplistic, two-variable, linear view of climate. Nature made fools of them and still does. Without these clearly inadequate models there is no alarming parabolic rise in temperature, no possible separation of manmade warming from a very gentle natural warming and therefore nothing to suggest that mans influence is anything other than insignificant. Now of course if you are employed by an institute that would be irrelevant if there were no manmade warming and if you had realised you had spent 25 years teaching the wrong thing then you are more likely to suffer bias and to be less scientific about it all aren't you? Basically the argument put forward is that the putative warming is masked by a putative cooling from an as yet unidentified source: Just how scientific is that? The real scientific position is to accept what the observations are screaming at you; that there is no "missing heat" in the first place. Could northern Eurasia and the Arctic region be linked in a way that would explain the drop in DJF winter temperatures? We know that Arctic temperatures are underrepresented in most datasets (or, like in GISS, guessed, I mean calculated). However, we also know from observations that the Arctic is getting warm fast - sea ice melts both in area and volume, Greenland glaciers shrink, the area with surface melting in Greenland increases and so on. Therefore my question is under what conditions (shifted jet stream like in January in the US? Other weather patterns??) could this be explained? Some things are mentioned, AO, snow cover, but would that suffice? this is an interesting question, to which there is no clear answer. May internal climate variability, i.e. unforced changes in 'weather and ocean patterns' be responsible for decadal and multidecadal quasi oscillation of the Northern Hemisphere or global surface temperature ? To what extent ? the NAO just distorts the heat advection by the atmosphere, just shuffling heat around , but not necessarily changes the global or Northern Hemisphere mean temperature, unless other mechanisms come into play. For instance we have seen this winter that a positive NAO produces a lot of storms and cloudiness over the North Atlantic and Europe, and less somewhere else. Clouds reflect solar radiation, so may be the global radiation balance is affected.